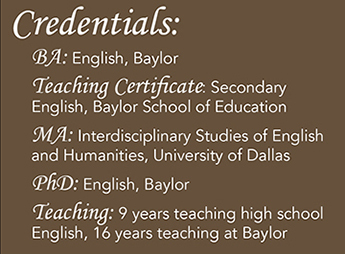 Each Baylor LLC has a Faculty-in-Residence (FIR), a faculty member who lives within the community to provide leadership and a focus on academics. The Impact LLC FIR is someone who possesses strong leadership skills, has experience in K-12 education, a passion for education, high Christian morals and values and the unique ability to create relationships among staff and students. With the intention of building a stronger community, the FIR supports the programmatic direction of the hall staff, and works directly with the Impact LLC Program Director and advisory board to plan programming and outreach opportunities. One clear benefit of a FIR deals directly with student success. Compared to their peers, students who live in a residence hall that houses a FIR generally have higher academic success during their first year. Getting connected to a professor, such as the FIR, even if he/she is not your own, breaks down barriers and makes future relationships between student and professor more effortless. Impact LLC Faculty-in-Residence, Dr. Mona Choucair, teaches in both the School of Education and the College of Arts and Sciences at Baylor. A senior lecturer in education and English for the last 16 years, Choucair is a student favorite, elected by the senior class as the Collins Outstanding Professor of the Year in 2008. My position as the Impact LLC Faculty-in-Residence is a natural extension of what I love to do already -- better understand my students and help them decide what they want to do for the rest of their lives," Choucair said. "I want young men and women interested in any form of teaching to know the profession is a beautiful one and that they can do it." Choucair said she loves teaching English because it mimics life. "Literature is an outlet to understand our lives in a different way, whether it’s about love or success, heartbreak or loss," she said. "When we move the classroom into the living room or an unexpected venue, discussions open up. It’s a chance to see a different side of each other." While teaching English for Baylor study abroad programs in Maastricht, Costa Rica and London, Choucair (dubbed "Mama Mona" by Maastricht students) has enjoyed spending time with students in her home. Sometimes it was the simple act of sitting on the couch, drinking coffee and discussing a novel that brought the study abroad groups together, she said. 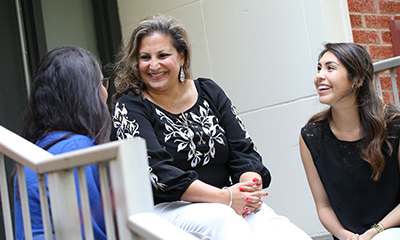 As the Impact LLC’s first Faculty-in-Residence, Choucair plans to use some of her core teaching values: passion, energy and a willingness to change with her students. Choucair said she looks forward to growing closer with Impact LLC residents by participating in community outreach activities, walking and talking along the Bear Trail, cheering at Baylor games and collaborating to create new classes. "I’d also like to show them I can do a little bit in the kitchen," Choucair said. "I plan on giving them a taste of my Lebanese cuisine. We’re definitely going to eat meals together!" Choucair has been working on a book project that focuses on the importance of adding young adult literature to traditional English curriculum used in secondary schools. "I think classic curriculum should never be done away with, but I think it should work hand-in-hand with the new literature that’s appropriate for young people," Choucair said. "If we can help our reading rates, it’ll help retention; it’ll help students get into better schools. If we don’t change with the times, we’ve lost the kids."